Posted on January 19, 2018 at 12:02 pm. 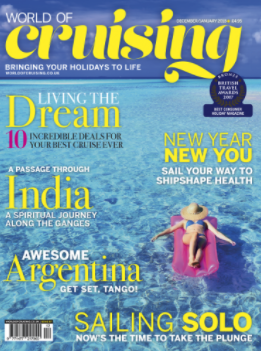 We are pleased to share that SeaDream Yacht Club has been featured in the December/January 2018 Issue of World of Cruising. Dream Cuisine – SeaDream Yacht Club likes to offer its guests a taste of the billionaire lifestyle. Learn more about our Executive Chef Andrej Havlicek and what makes the SeaDream experience so special. Unusual for a cruise ship, SeaDream caters well for vegans, offering what it calls “raw food” at breakfast, lunch, and dinner. Award-winning, gourmet cuisine is prepared a la minute with the freshest ingredients and served open-seating in the Dining Salon or alfresco. Sunset, cocktails & canapes are the perfect endings to each day.